Echo Lake, itself, comprises about 12 acres on the surface, and is approximately 30 ft. deep at the lowest spot. Most of the Echo Lake Neighborhood is in the Lake Ballinger/McAleer Creek Watershed. Water enters the lake via three small streams and run-off from the higher ground. 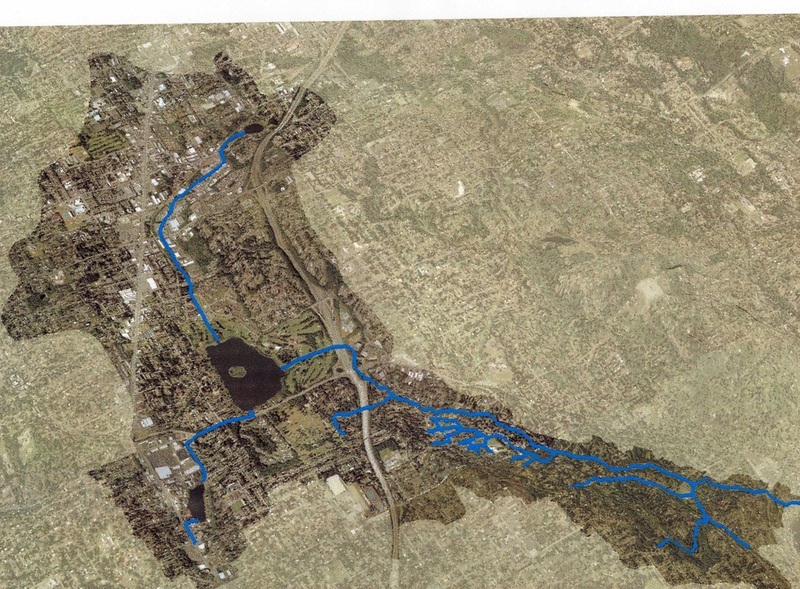 If you follow the blue lines, you will see that there are two watersheds and three lakes involved here. First, on the northeast, there is very small Halls Lake. On the southwest, there is Echo Lake. Both drain into Lake Ballinger, toward the center (the one with the little island). A few areas in the Echo Lake Neighborhood drain directly to Lake Ballinger. From Lake Ballinger, the water flows east into McAleer Creek, turning southeast and eventually meandering into Lake Washington. The water from a third stream is near the freeway in the Northridge area. The original streambed is now a twisting street known locally as "The Windey". It turns to the east under 200th, goes under the freeway, and at some point goes aboveground to flow into McAleer Creek. The blue markings on the map look like dropped yarn. The map on the right shows the Watershed -- the sources and flow of water around the lake. Virtually all the streams in Echo Lake neighborhood were put underground, in culverts, many years ago. The map shows one small stream still flowing into Echo Lake from the west, going under Aurora. Along the way, McAleer Creek picks up contributory waters from other sources, and eventually all the surface water flows into Lake Washington. In addition, a volunteer group called Streamkeepers monitors the health of the streams that flow through the town of Lake Forest Park directly into Lake Washington. For further information, see the website: http://lfpstreamkeepers.org. Volunteers testing the water of Echo Lake. 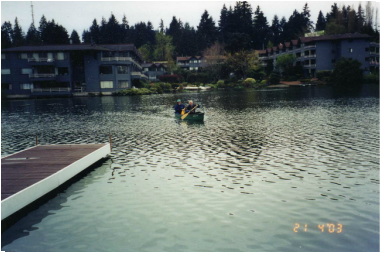 Over the course of 15 years, volunteers tested the quality of the water in Echo Lake, delivering samples to King County. When the City of Shoreline incorporated, the city then took over the sampling. The Small Lakes Program can assist whenever someone finds a problem (such as excessive or questionable algae). The lake has almost always been within appropriate ranges, remaining substantially healthy, with abundant wildlife and clear, pure water. One exception came when the area had a major issue with geese which had stopped migrating because of the availability of food. That year, the increasing fowl populations raised the levels of feces-borne contaminants. Since the waterfowl population was reduced and discouraged, the lake has consistently been at normal levels. Property owners in the lake basin should be mindful of their contribution to the health of the lake. It is essential that no unwanted chemicals or debris enter into the surface waters or the lake itself. Pesticides are certainly harmful, as might be expected. But the water quality is also endangered by plant and lawn food because of the nitrogen levels. Soap of any kind, whether environmentally friendly or not, is harmful to the lake waters. Residents are encouraged to wash their cars at professional locations. People who must wash their cars at home are requested to put the cars on the lawn when washing them, so the soapy water will be filtered through the ground before it reaches the lake. And everyone must use natural, biodegradable and nontoxic products for cleaning and yard care. The primary problem is one of phosphorus. It is caused by fertilizers, pesticides, and pet waste. Car washes and feeding animals outside also contribute to the problem. At the edge of the lake, the shore line, it is good to have thick vegetation to catch such debris before it can enter the water. New projects around the lake, such as the Gateway development, the buildings at 192nd and Aurora, the rain garden at the Park-and-Ride, and the Sky Nursery project, have contributed to the good health of the lake. Water from these sites is now filtered before it enters the lake.